In the second part of our summer food series with chef Gizzi Erskine, the supercook joins three other food experts for a lively debate about nutrition, the obesity crisis and food fads. Gizzi is a familiar face on television cookery shows and has appeared in Cook Yourself Thin, Cookery School and Sunday Brunch. She is the author of several best-selling cookery books, including Gizzi’s Kitchen Magic. Marcela Fiuza Brito is a spokesperson for the British Dietetic Association and a specialist cardiothoracic dietitian at west London’s Royal Brompton Hospital. She also runs a private clinic where she advises clients on how to improve their diet. Joshua Hardie, as director for corporate responsibility at Tesco, is charged with helping the supermarket’s customers and the wider community with challenges they face in health, food waste, employability and sustainability. Health coach to the stars Madeleine Shaw began her blog three years ago after overhauling her diet and introduced both wholefoods and the cutting out of sugar, to improve her own health. As a trained nutritionist, she published her first book Get the Glow in April. Karen Attwood hosted the roundtable discussion over lunch – a healthy one, of course. There is a lot of confusion and mixed messages about what constitutes a healthy diet. What does it mean to you? Gizzi: For me, healthy eating is about nourishment. It’s about giving your body what it needs in order to survive. But I believe food feeds many things and it is also emotional. I feel very much like we are starting to lose touch. A healthy attitude towards food is as important to me as having healthy foods in the body. Madeleine: I agree. I don’t believe it is about being perfect all the time. I think “eating clean” is eating fresh, good-quality produce and cooking from scratch. It is about what you eat, but it’s also how you eat and about really taking time to chew food. I think a lot of us eat our food mindlessly. But it’s also about enjoyment: if you don’t like kale, don’t eat it. Joshua: It is about a love of food. If you are willing to experiment, have fun, sit around as a family and eat, then you tend to have healthier diets. That is at the heart of it. But it is also realising that there are lots of different people out there and … you have real barriers, such as motivation, time and cost, and they all inter-relate. If you don’t have time and motivation, then you might find it more expensive to eat healthily. Marcela: Yes, I agree with this interaction between motivation and time and costs. I cook from scratch every day but my life is talking about food … people are busy. I’m not supporting ready meals in any way, but to have a healthier line of ready meals – that is how supermarkets can make a contribution to those not able to cook from scratch on a daily basis. Do we need to have a restrictive diet and cut things such as sugar? Gizzi: I do think that sugar is the biggest problem in the modern world, with regards to food. We eat enough sugar by eating normally through the day if we eat carbohydrates and fruit. Everything we have that is refined sugar on top of that is excess but … we need to stop obsessing. We come from two extremes, obesity and extreme health. I am saying moderation is the key and if we are doing good most of the time – eating fresh food at home, as good quality as you can afford – with the odd treat, that’s fine. Madeleine: It is the hidden sugars in sauces, soups, bread, that are the ones we should be watching out for. I don’t think I am perfect and I do still eat things that contain gluten and sugar, but I try to create things without them. When I started, I had really bad IBS [irritable bowel syndrome] and digestive problems, and when I cut them out, that is what changed everything for me. It has helped me, but I am not saying it is for everyone. Marcela: Gluten is in lots of diets and it is important for our health. You have people with coeliac disease, an auto-immune disease, but you have people who don’t have coeliac disease but show some symptoms that are similar. The only way to [test for food intolerance] is by a food-exclusion period of three or four weeks. If symptoms return afterwards, then you know. But you [Madeleine] had symptoms when you ate gluten, so why would you eat it, if you feel so much better without it? What responsibility do retailers have for making the UK healthier? Joshua: Shops can play a role. You can change the layout of shops. Marcela: You have removed sweets and chocolate from the checkout … but put crisps there. Joshua: Yes, but only baked crisps. It is a tricky one. We talked to customers who said they wanted us to help them. So, we said, we are going to take sweets out, so what do we put there instead? Customers say: “Can you help switch me out of fried crisps to baked crisps, or get me eating more nuts and dried fruit?” Since the changes, the healthy snacking range has done much better than ever before. And while I see that there may be concerns about individual items in the range, moving millions of shoppers in that direction overall, we feel, is quite a good thing. Marcela: From a dietitian’s perspective, considering the crisis we have in obesity, it seems like a very small step. I am not blaming the industry entirely but there is more that we can do. Joshua: Yes, there is more we can do. Now, in our stores, the first thing you see is the fruit and veg. That changes the mindset, it makes you think about cooking. Another area where you can make a big difference is reformulation on soft drinks. Is there too much emphasis on the appearance of chefs and bloggers such as Gizzi and Madeleine, giving young people an impossible ideal to live up to? Gizzi: I have struggled with this for the past 10 years of my career. I look a certain way but I am a trained chef. Part of it is based on my image and the way I look, but I always think the proof is in the pudding and I have proved myself as a cook. But it is frustrating that the industry focuses in on the aspirational figure, of course it is. Madeleine: I think you make it not about you but the food. Of course, they see you as a person, but it’s not about you taking posey pictures of yourself, it’s about the food. Marcela: When I think of the food bloggers around in social media, l believe it is such a good thing to have healthy food out there. I am against telling people to exclude food groups if they don’t need to exclude food groups. But if people are becoming more interested in food and healthy food, that is really positive. Is there one thing you would advise people to change? Marcela: I think we should start to move away from looking at single nutrients or one superfood, or just fat and sugar. It is about the whole diet. I am a big advocate of the Mediterranean diet, which is scientifically proven to protect against heart disease and improve health. Whole grains, nuts, seeds, olive oil, lean protein, low-fat dairy products. Joshua: The real answer is little changes, caring about food a bit more, cooking a bit more. But we have a cultural problem here. It’s an entrenched cultural problem that has taken generations to bed in and the only way of getting out of it is to change that culture. You need a societal change. Gizzi: I feel we need to be eating better quality meat but less of it, more veg-based foods. 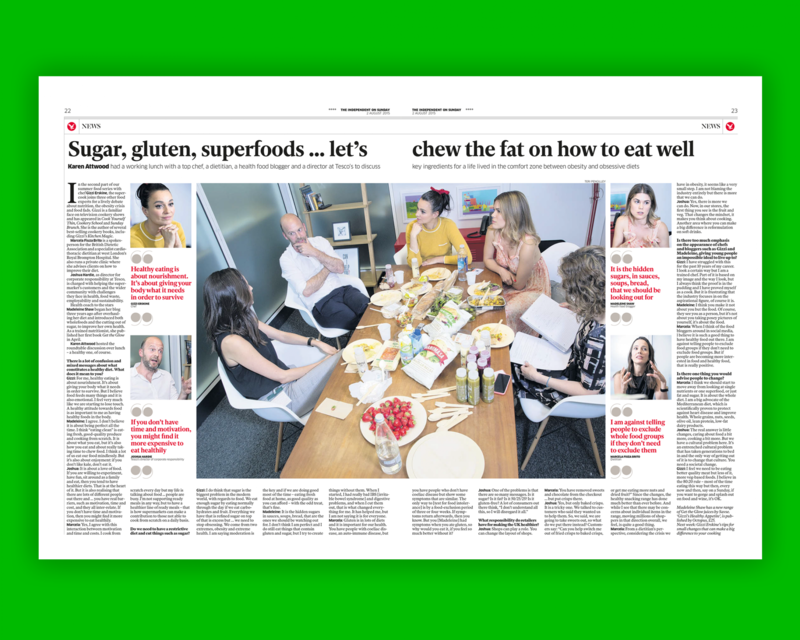 I believe in the 80:20 rule – most of the time eating this way but then, every now and then, say on a Sunday, if you want to gorge and splash out on food and wine, it’s OK.
Madeleine Shaw has a new range of Get the Glow juices by Savse. ‘Gizzi’s Healthy Appetite’, is published by Octopus, £25.